Icelandic composer Johann Johannsson, widely considered among the most interesting of the current generation of film composers, died in February at the age of 48. But the Oscar-nominated composer of The Theory of Everything, Arrival and Sicario had completed more work before his death. His final score, for Mandy — Panos Cosmatos’ wild horror-revenge thriller starring Nicolas Cage — is a dark, massive, industrial-metal sound that matches the grim, violent, sometimes insane milieu of the film. I interviewed the director, his manager Tim Husom, and his agent Kevin Korn, about this last work and about the new foundation in the late composer’s name. 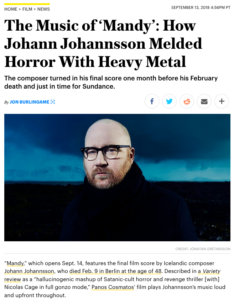 This entry was posted in Composers, Film Music, Interviews and tagged Johann Johannsson, Johann Johannsson Foundation, Kevin Korn, Mandy, Panos Cosmatos, Variety on September 14, 2018 by Jon Burlingame.